Centipedes are terrestrial and predatory, and about 3000 species have been described so far. They vary in length up to 30 cm. The longest centipede is Scolopendra gigantea found in tropical America, which can catch and eat lizards and mice. The centipede below is a tropical specimen of almost 25 cm long. North American and European centipedes usually range from 3 - 6 cm long. They have long antennae, small mandibles, 2 pairs of maxillae and poison claws operating under the head (see below). A few species are luminescent. All centipedes suffer from water loss, so are mainly nocturnal, and remain hidden during the day time in leaf litter, under stones etc. to avoid water loss. Centipedes have from 15 to 181 leg-bearing segments, plus two terminal segments; they always have an odd number of segments. British centipedes have 15 - 101 leg-bearing segments. Each leg-bearing segment has one pair of legs. The first segment (just behind the head and not easily seen) has two legs that have been modified to catch prey, and are hollow fangs connected to poison glands (see below). The last pair of legs are often longer than the others and act as rear- facing antennae (see Scutigera coleoptrata). Centipede venom is painful, but in most cases is not lethal to humans. However human deaths have been reported from Scolopendra gigantea bites if the victim is not in good health, old, or young. 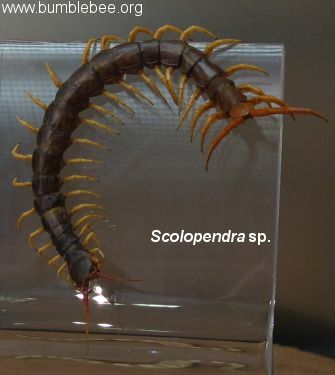 Below is the typical body pattern of a Scolopendra centipede, note that it does not have alternate short and long plates as in the European centipedes. Centipedes have two groups of simple eyes though some species lack eyes, or have weak eyesight, but other species have good sight for detecting movement. Some species have repugnatorial glands which can exude hydrocyanic acid. Many species have a courtship behaviour of touching and stroking. In some species this can last up to an hour. The male deposits a spermatophore on a web for the female then picks up. The female lays her eggs, usually 15 - 35, in a cavity, and guards them until they have hatched and dispersed. Some species are viviperous giving birth to already hatched young. In the U. K. eggs are usually laid in spring and summer. Most are nocturnal. In sunshine and dry conditions they suffer from dehydration. They prefer moist places, so are usually found in soil, decomposing wood and leaf litter, under bark and stones, and in compost bins. They will try to eat anything they can catch, but usually live off earthworms, and insects, especially cockroaches. In the U. K. their main prey items are worms and insect larvae, but they will also eat other centipedes. Large tropical species can eat toads and snakes. One individual kept in Regent's Park Zoo in London was fed on small mice. The prey is usually located when it touches the antennae or legs. Some species with good eyesight can rear up and catch flying insects. All centipedes are venomous. Recently some of the more colourful tropical species have become popular as pets. They do make interesting animals to observe, and can live for several years if well looked after, but they are not suitable where there are young children as the ones sold as pets are usually highly venomous. Species in the Scolopendra genus (below) are very popular, but these are active hunting predators that prey on rodents and bats in the wild. Their bite is painful, but rarely fatal to humans, so they do need expert handling, and are certainly not suitable for children. It might be better to start off with a tropical millipede - you'd get more legs for your money anyway!